iPhone apps part of parenting skills? 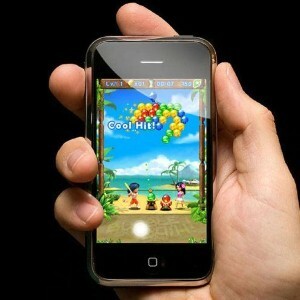 Home » Kids » iPhone apps part of parenting skills? For fathers who enjoy embracing new technology when it becomes available, there may be some applications for the iPhone that could be useful as a positive reinforcement for their young son or daughter. Aside from being an innovative touch phone, Apple’s iPhone is capable of holding an assortment of games from its "app store," some of which may appeal to a younger audience. However, fathers should use their parenting skills and only allow their child to play a game if they either finished a household chore or accomplished something significant at school. According to the Examiner.com, the following are some kid-friendly iPhone games that may be used by fathers as a reward: Rolando, which features a cast of characters rolling and jumping through different settings, and Bounce On, which has a tiny bouncing ball that picks up diamonds along the way. With the latter game, the child will have to tilt the iPhone to make the ball roll and tap the screen to make it jump. Fathers are reminded to not let their children spend too much time on the iPhone and to explain to them that they are borrowing it and that daddy’s phone isn’t to be thrown around.